Gold and miners have been under terrible pressure lately. But traders saw some light at the end of the tunnel on Tuesday. That’s when Federal Reserve Chairman Jerome Powell “blinked” in his long campaign to raise the Fed’s benchmark interest rate. That sent gold higher. And a new rally could just be starting right now. That’s a big change from Powell’s October speech, when he said the Fed was “a long way” from neutral. First, let’s look at the spread between the December 2018 and December 2019 eurodollar futures. 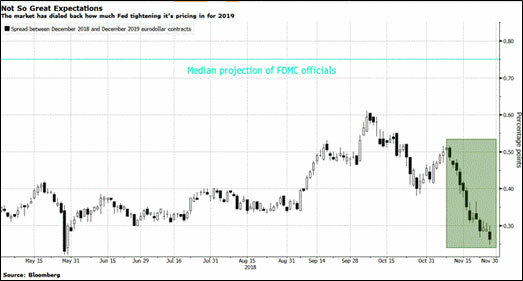 It’s a measure of how much tightening traders expect next year. It was already falling. After Powell spoke, it fell even harder. The market is currently projecting much more dovishness than FOMC officials have been talking about. I guess traders think the Fed governors talk the talk, but the market doesn’t think they’ll walk the walk. Fewer rate hikes means less upward pressure on the U.S. dollar. And sure enough, after Powell talked, the U.S. dollar swooned and gold and miners revved their engines. A strong dollar has weighed on gold since October. 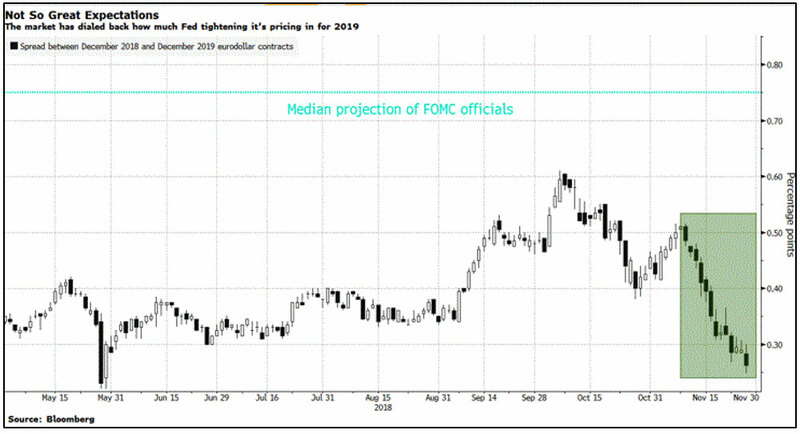 If that’s about to change — and it sure looks like Powell is opening the door — that could be rocket fuel for the next move in metals and miners. Now, here are two ways you can play it. This is a performance chart. It shows the VanEck Vectors Gold Miners ETF (NYSE: GDX). Those are the big gold miners. 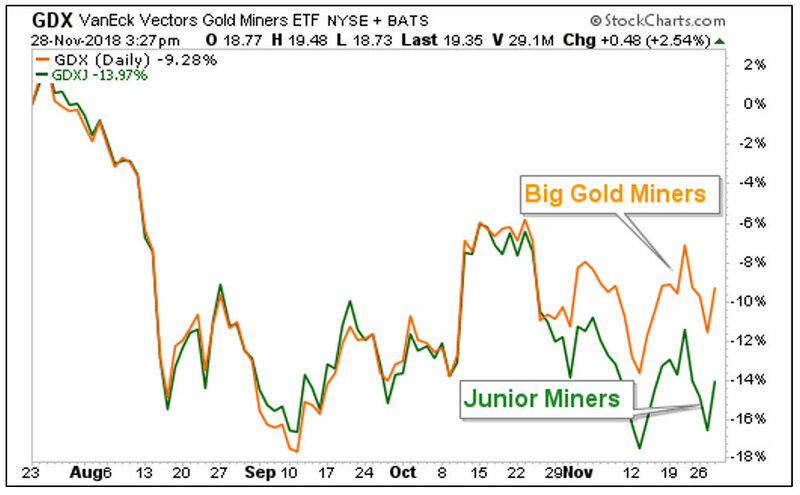 And the VanEck Vectors Junior Gold Miners ETF (NYSE: GDXJ). Those are smaller miners. You can see miners both big and small fell hard in the most recent gold weakness, which was triggered by dollar strength. Now, if the dollar is going to top out, and gold goes higher, what might you do? Well, a more conservative investor might choose to ride the big miners, the GDX. 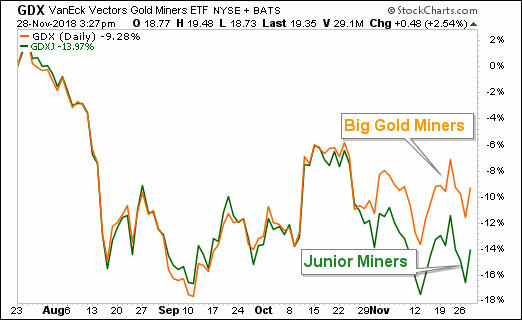 But a more speculative investor might buy the junior miners, the GDXJ, which were beaten down mercilessly. Because the next move in that could be extraordinary indeed. Do your own due diligence. But if you’ve been waiting for the market to give you a signal, many traders think Chairman Powell just called the top in the dollar. The light at the end of the tunnel is blinking “green” for go. And that’s bullish for gold.